A Quinceanera is an elaborate birthday celebration: an event and time that define the transition from childhood to womanhood. Typically when you are about to turn 15, now a days 16 as well, family members and friends come together to celebrate you and your special day, which means all eyes your Quinceanera dress. 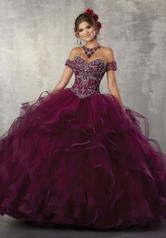 We have a huge selection of ball gowns in different styles and colors. 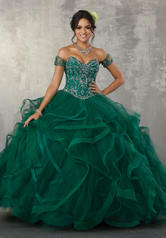 Opt for a unique Quinceanera dress with a multi-color ombre skirt, something more classic with the timeless sweetheart neckline with beaded bodice, or make your small waist extra defined with a V-waistline Quinceanera gown. Typically majority of Mori Lee and Viscaya�s Quinceanera gowns have a corset lace up, which adds a nice detail, you can choose from one-of-a-kind zippered backs with delicate cap sleeves. Whether you prefer a super ruffled skirt or a simple tulle bottom with ideally placed sequins and beads, we have the ideal Quinceanera dress for your special night! 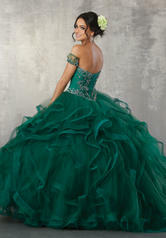 The fabric in this Vizcaya Quinceanera by Morilee style is Jeweled Beading on a Flounced Tulle Ball Gown. Detachable Beaded Arm Cuffs. Matching Stole included.